Biodex System 4 will provide valuable, isolated muscle-performance data. Test results, combined with established targeted outcomes, can be used for pre-emptive injury screening, managing rehabilitation and determining readiness for return-to-play. Upgrade path available for existing System 4 and System 3 dynamometers. 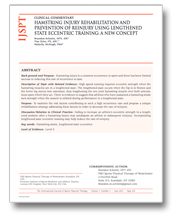 Learn more about protecting athletes from reinjury by adding lengthened state eccentric rehabilitation to your existing hamstring program.